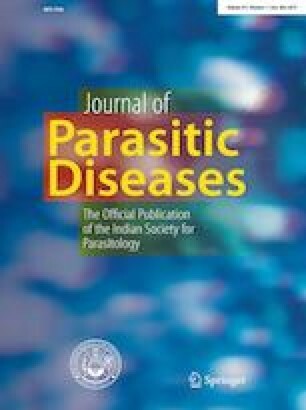 The present study was undertaken on epidemiology and diagnosis of babesiosis in sheep and goats in Bengaluru Urban and Rural districts of Karnataka state from November 2017 to May 2018. Out of 343 (225 sheep and 118 goats) blood smears examined by Giemsa and acridine orange (AO) fluorescent dye staining methods, 3.55 and 4.0 per cent of sheep and 0.84 and 1.69 per cent of goat samples were found positive for Babesia organisms, respectively. The sensitivity and specificity was found to be higher in AO fluorescent dye staining method. In agewise susceptibility, the percent positivity was found to be higher in animals > 6 months old. In genderwise susceptibility, the percent positivity was found to be higher in females than males. Hence, AO fluorescent dye staining method is found to be very rapid and cost effective diagnostic method for treatment and control of babesiosis. The facilities provided to carry out research work through Centre of Advanced Faculty Training, ICAR, New Delhi is greatfully acknowledged. SK, GSM and PED conceived of or designed study. SK performed research. SK, JNL and SS analyzed data. SK and GSM contributed new methods or models. SK and GSM wrote the paper. The work was carried out in a Teaching Veterinary Clinical Hospital and Research Institute, Veterinary College, Bengaluru, Karnataka Veterinary, Animal and Fisheries Sciences University (KVAFSU), Bidar, India. The KVAFSU 2004 Act legislates collection of clinical materials for the diagnosis and treatment of animals.